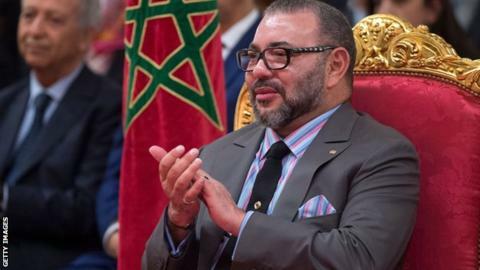 Mohammed VI, the King of Morocco, has offered his "unconditional support" for the bid and says his country would host the event in "the spirit of peace and tolerance"
Morocco's "exceptionally low murder rates" and "very low gun circulation" are among the reasons it should be chosen to host the football World Cup in 2026, it says in its bid book. The Moroccan Football Federation has submitted one of the two bids for the event, competing with a joint bid from Canada, Mexico and the United States. The 2026 World Cup finals will be the first to feature 48 teams. World governing body Fifa could announce the tournament host in June. Morocco - making a fifth attempt to stage the event - has submitted a 193-page document to Fifa, highlighting why it is "a showcase for the best of football". The document says the African nation is "one of the safest countries in the world" and will offer "an ideal security environment" for the tournament. Gun law and policy is one of the key political debates in the United States, following several mass shootings in recent years. "Exceptionally low murder rates (three per 100,000 people), benefitting from very low gun circulation, are reflected in a United Nations Office of Drugs and Crime (UNODC) study ranking Morocco among the best-performing nations in the world - at the same level as both Denmark and Japan," says the Moroccan bid. Mexico had a murder rate of 21 per 100,000 population in 2017 - the highest figure since modern records began in 1997. An FBI report said the murder rate in the US was 5.3 per 100,000 people in 2016, while Canada's was 1.68 in 2015, according to UNODC. The joint Canadian, Mexican and American bid, submitted in a 530-page document, says each nation's federal government will "dedicate all necessary resources" to ensuring a safe and secure World Cup if it is selected as the 2026 host. The respective bids also lay out plans for areas such as stadia, travel, accommodation and legacy. Fifa officials will weigh up both bids and make a decision when they meet in June - though they could also choose to reopen the bidding process and extend it until 2020 if they are not happy with the two bids in place.